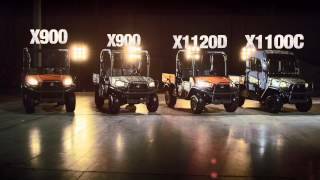 Kubota RTVX Series - Model Landing - Camrose Dynamic Sales & Service Inc. Built to take on the toughest jobs in the roughest places, thanks to a robust diesel engine, and dual independent suspension. Expect a smoother ride, better driveability and more legroom throughout. (Variable Hydraulic Transmission) Kubota has more experience in variable hydraulic transmissions than any other Utility Vehicle manufacturer. Kubota's advanced VHT-X offers a wide torque band and large oil coolers that boost performance and durability. You'll shift less often and maintain better control, thanks to new transmission gearing with just two forward speeds (high and low), plus neutral, and reverse. The split-bench style seat is ergonomically designed to provide hours of riding comfort. The driver's side is adjustable fore and aft. *Driver's side seat adjuster is not available on RTV-X900 General Purpose models. Responsive hydrostatic power steering gives you the control you need to tame any terrain. The steering wheel is tilt-adjustable, allowing you to set the optimum angle for your driving style. *Tilt-feature is not available on RTV-X900 General Purpose models. Open the hood, and you'll find the radiator and air-intake located high and up front, where the air is cleaner and cooler. This improves both radiator performance and simplifies maintenance. Kubota's wide fin pitch design minimizes clogging, further improving radiator performance. The new X-series raises the bar on ground clearance—to a full 10.4" with 8" of suspension travel—letting you glide over the bumps rather than through them. With the flick of a single lever, the hydraulic-lift cargo box rises and your cargo slides out. Cargo that could take significant physical strength and time to unload can now be dumped with little effort in mere seconds. *Manual dumping on RTV-X900 General Purpose model. True 4-wheel drive with a limited-slip front differential and a locking rear differential help reduce wheelspin to a minimum, giving you greater control and a smoother ride on rough or muddy terrain. Obstacles on the trail? CV joint protectors and heavy duty skid plates will protect the most critical parts of the engine and transmission. Bright and far-reaching halogen headlights. You'll feel more secure, especially when traveling down long inclines, knowing that dynamic braking is providing additional braking power and greater driving control.